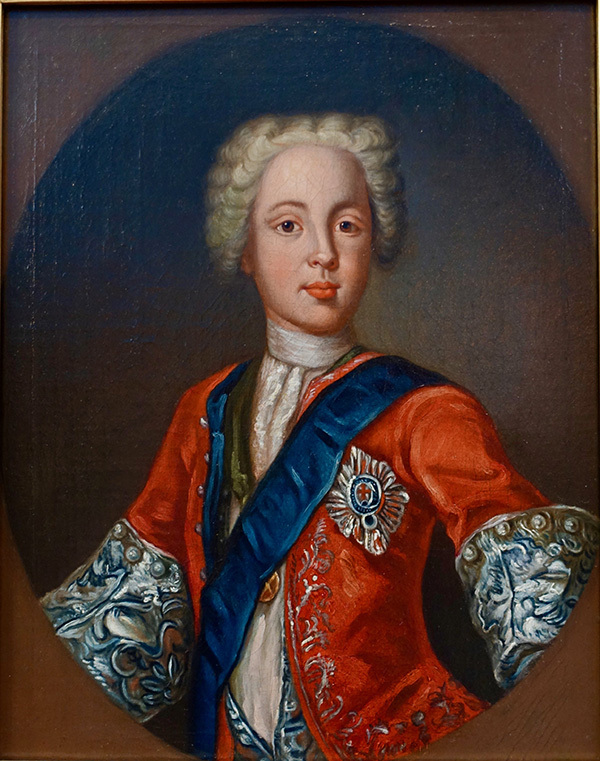 While a diminutive painting of Prince Charles Edward Stuart (Bonnie Prince Charlie) at age 12, presented a cheerful and exuberant youth, the pièce de résistance of this other grouping was the sizable portrait of a man with a powdered wig, wearing a blue sash, and dressed for battle. “That picture was painted in 1717 and is based on an Antonio David. 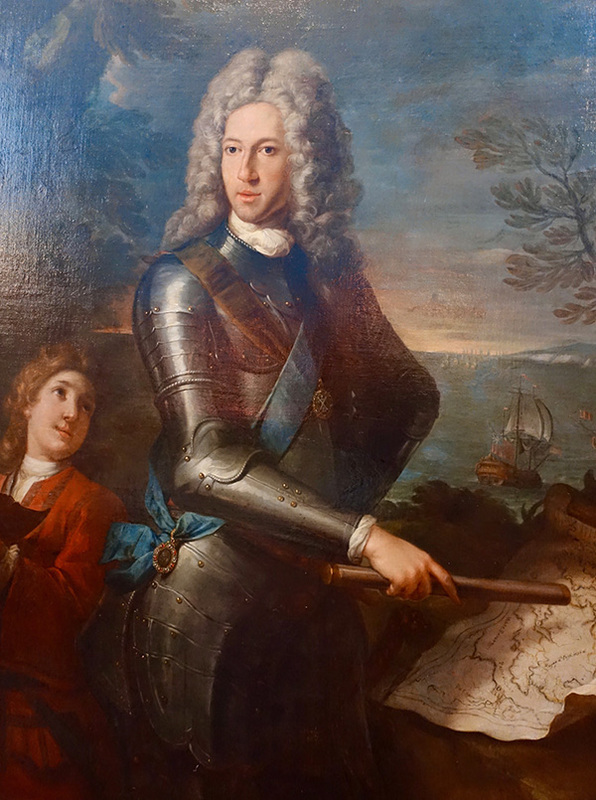 This is James Francis Edward Stuart, Bonnie Prince Charlie’s father otherwise known as ‘the Old Pretender’. His very birth sparks controversy. James’ father, James II of England/James VII of Scotland has the throne, but before this I need to give you the context. Scotland, England and Wales are Protestant countries and up until James II all monarchs from Elizabeth I to himself had been so. However, when James’ brother Charles II was on the throne, James converted to Catholicism. Parliament didn’t see it as a problem as the King would surely have heirs. Unfortunately for Parliament, Charles died without any legitimate children (but plenty of illegitimate ones!). So the throne passed to his brother James (II). Parliament viewed this as a temporary blip. James at that point only had two Protestant daughters as heirs. However, James married his second wife and James Francis Edward Stuart was born. Immediately the rumour mill cranked out propaganda, which spread through the streets, stating that the royal baby had died and another had been snuck in its place in a warming pan no less. Not practical or possible. Ha-ha! But it demonstrates Parliament’s fear at the potential of having a Catholic male heir. They believe there is a real possibility for a return to Rome and Parliament didn’t like it. 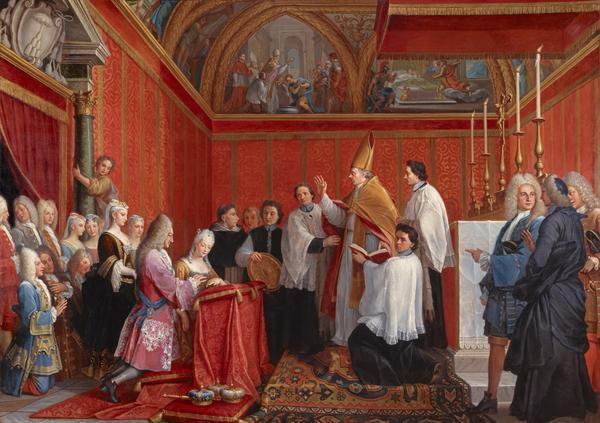 So, they invite James II daughter Mary and her Dutch husband, William of Orange to take the throne in what gets coined ‘The Glorious Revolution’. Again, it shows a certain level of propaganda. They force James to flee to France where he later dies heartbroken in Saint-Germain. The Pope declares his son James Francis Edward Stuart as King James III of England/VIII of Scotland, but it isn’t recognised in the two countries. Interestingly, James doesn’t make a move for the throne until both sisters, Mary and Anne have reigned and died childless. Although, Anne did have 18 pregnancies and none survived to adulthood! So James took part in the (Jacobite) rising of 1715 trying to win back the Stuart throne. Funnily, he was even declared king on the Mercat cross at Castlegate in Aberdeen. Obviously it wasn’t official but it demonstrates a certain level of support for their rightful King, in Aberdeen at least. After the failed rising of 1715, the English made a treaty with the French, exiling the Stuarts from France. The Pope of the time gifts them a palace and an income and a separate court was formed in Rome where loyal supporters flock to. One must bear in mind, the French King was a cousin to the Old Pretender, and keeping the Stuarts in Rome was one of the many conditions to declare peace between the UK and France. The Old Pretender’s two sons, Charles Stuart the Bonnie Prince, and his brother Henry Benedict, who became a cardinal, were born in Rome. All three Stuarts still rest in the Vatican to this day. But in this glorified painting circa 1717, James is presented in his armour and is clearly symbolising that he is preparing for battle. This can demonstrate multiple strengths that we would need in our sovereign. Over his armour is the the blue sash representing he is a member of the Knights of the Garter. This is associated with royalty and nobility and is considered to show chivalry and honour—again, all the things the British would want in their monarch. One account says: ‘Legend has it that the garter of a lady the King was dancing with slipped to the floor, prompting the King to pick it up and tie it on his own leg. To those that snickered, he proclaimed: ‘Shame upon him who thinks evil upon it’, which became the Order’s motto. It has been in continuous use since then. Attached to the sash are two icons. The unmistakable blue and white cross of St Andrews and at the bottom St George riding his horse to battle the Dragon, encircled in gems of red and white. Their position could echo the locations on the map. However, James is demonstrating that although he isn’t at home he is aware of current affairs —by 1717 the crowns of Scotland and England have been united into one. I believe this is what he is representing. He may be gone, but he sees all and perhaps he approves, but either way it’s still his crown! My God, what a revelation! Thank goodness the executions, risings and battles are part of the distant past and it is golfers, anglers and newlyweds who populate this historic part of Scotland. Not that a few other revolutions haven’t played out in the British Isles in more recent history, but at least the times of being beheaded by a sloppy axeman are behind us. So it is my opinion that Danielle, who truly has a gift — both in belles lettres and verbally — for bringing these historical figures to life, is the real treasure of Aberdonia!